While pressure treated wood decks are the most common, cedar wood decks make up a good share of the remainder. This guide to cedar decks provides you with information about this material, so you can compare it to your other options including pressure treated lumber, redwood, IPE and other options. We include cedar deck pros and cons as well as cedar decking costs for you to review side by side with deck prices for other materials. Finally, if you’re looking for a contractor for cedar deck installation where you live, the service we offer will help you find the lowest installation estimates from contractors where you live who are ready to compete for the work. Cedar deck material is cut from the heartwood of the cedar tree. Cedars do well in wet areas because they produce natural oils known as extractives that make the wood resistant to rot. Having said that, it is still recommended that you seal your cedar decks to enhance the wood’s resistant to moisture and decay. 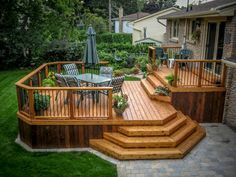 Both red cedar and white cedar makes excellent deck material, though Western red cedar is considered to be the superior cedar decking material. Most cedar decking is 5/4” thick, known as five-quarter decking. Boards 2” thick is available too. The most common widths are 6” and 8”, and lengths range up to 20’. Note that 5/4” decking is acceptable for spans of 12” to 16” while 2” decking is suitable for a span up to 24”. 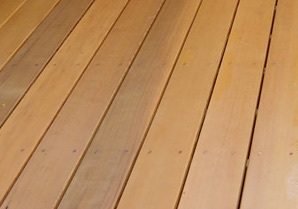 Cedar decking is available in several grades, and the top grades are those that are relatively free of gummy resin. Those resins can hinder the absorption of stain and sealer, so resin-free material is the best choice for your cedar wood deck. Both knotty and clear cedar decking is produced by most manufacturers, so you’ve got a choice in the look of the wood you use. If your top priority is a deck with a real wood look and feel, red cedar might be your very best choice. Knotty cedar decking offers a rustic/country look while clearer materials look fantastic with more sophisticated architecture. While cedar isn’t as corrosive to fasteners as pressure treated lumber, it still makes sense to use galvanized, aluminum and stainless steel wood screws. Avoid electro-plated fasteners as they’re prone to quick disintegration due to a reaction to the natural oils in cedar. The best nails to use, if you choose nails instead of screws, are thin-shanked, sharp nails rather than those with a blunt point. When fastening cedar planks within a few inches of the end of the plank, drilling pilot holes will reduce the risk of the wood splitting. Let’s look at the pros & cons of cedar decking, starting with its benefits. 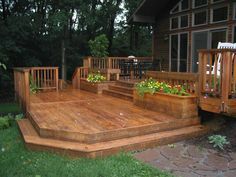 There is no “perfect” deck material, so let’s consider a few of the drawbacks of cedar decking. How Much Does it Cost to Build a Cedar Deck? These cedar decking prices will help you estimate the cost of your new deck. Note that lumber prices vary from year to year based on supply and demand and other factors. Here are current prices for cedar decking material. Given these lumber costs, here are prices for all the materials plus the labor to build your cedar wood deck. There are several factors that create this wide range of prices. You’ll find the lowest prices from deck builders in your area if you request estimates from several contractors. Let them know they’re competing for the work, and you’ll receive their lowest bids. Repairing a deck costs more per square foot than building a new deck. These are the most respected brands among deck builders and DIY homeowners. These tips will help you get the beauty and longevity you desire from your cedar deck. This brief cedar deck Q&A covers additional important information. How is cedar better than composite? Cedar costs less, won’t heat up in the sun as much as some composites and is a more sustainable material. Can my cedar deck be painted now that it is gray and dull? Yes, cedar can be painted. If the deck has previously been stained with oil-based material, you might need to use an oil-based paint to get it to properly adhere. 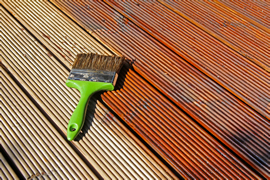 Are there advantages to paint for cedar decking? Paint offers more UV protection than stain, and the coating created by high-quality paint might last longer and be more resistant to the penetration of moisture into the wood. The disadvantage is that you lose the wood look that stain preserves. How many linear feet of decking are there in a square foot of deck? It depends on the width of the decking. The Western Red Cedar association says that there are 3.25 feet of 4” board in a square foot and 2.1 feet of 6” material per square foot. Our goal is to provide you with comprehensive deck information you can use to choose the right material and build a deck you’ll love in the years to come. The quality of the deck installation is a major factor in how good it looks, how safe it is and how long it lasts. Therefore, we want to help you find a deck builder in your area that will do a fantastic job. Feel free to use our convenient, free service that requires filling out one simple form. 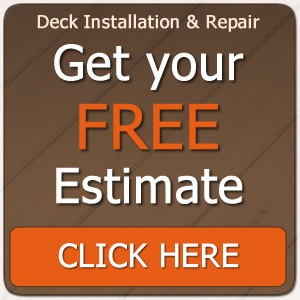 You’ll receive free written estimates from three qualified deck contractors who have been screened for experience. There is no cost or obligation for using the service. 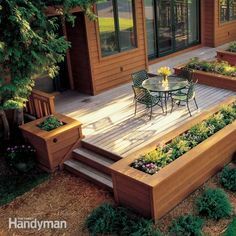 deck benches and planter box ideas. Inspiration for Tony.. He says he's building the deck this summer and I can't stop him, so I might as well help.